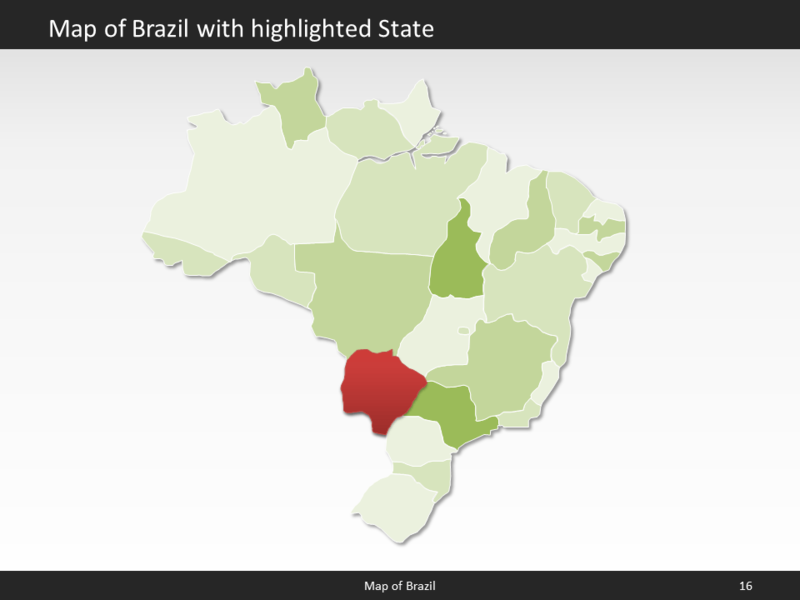 Premium PowerPoint Map of Brazil. 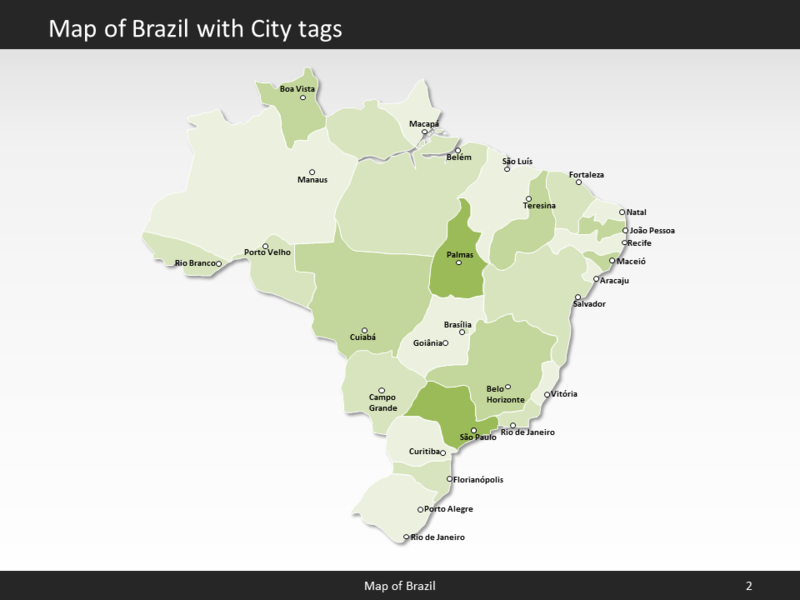 This detailed PowerPoint Map Template shows Brazil states, biggest cities and the Brazil state capital. 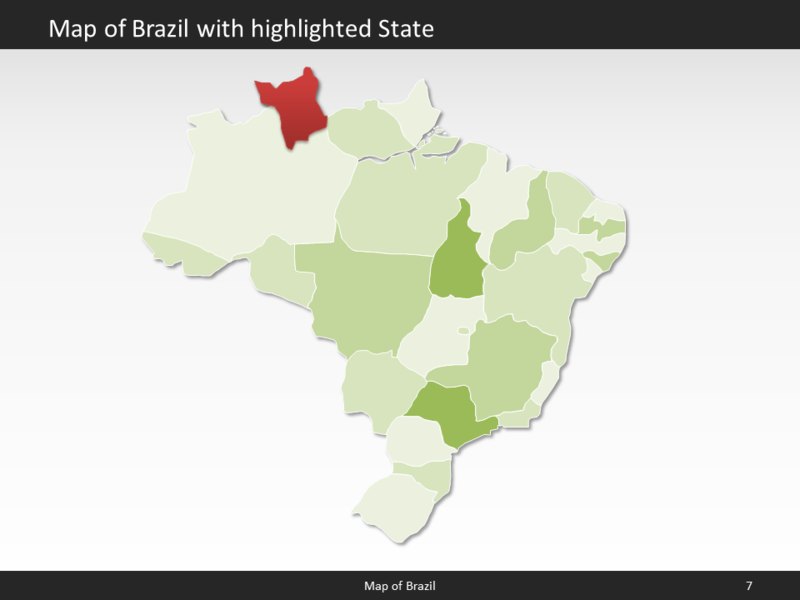 The Brazil PowerPoint Map is hand drawn and fully editable in size and color. 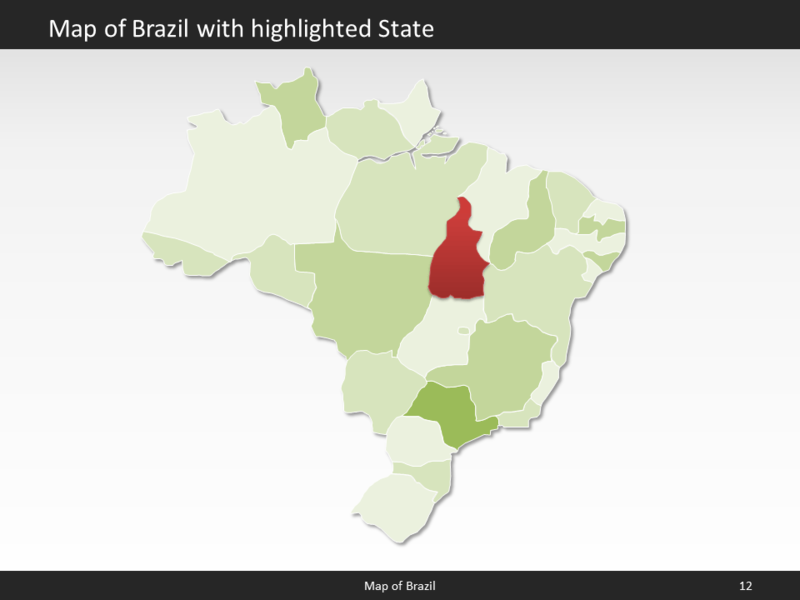 Premium PowerPoint Map of Brazil. 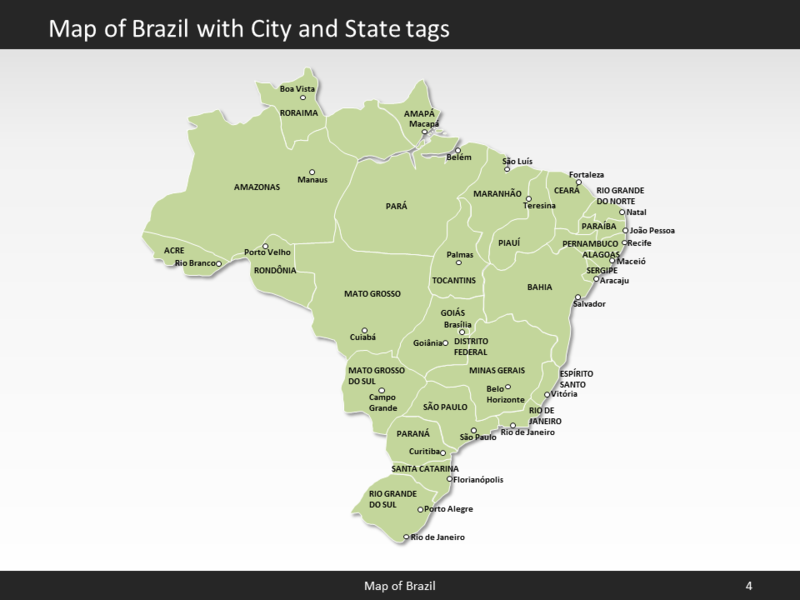 This detailed PowerPoint Map Template shows Brazil with states names and biggest cities including the Brazil capital.The Brazil PowerPoint Map is hand drawn and fully editable in size and color. Every state can be extracted simply. 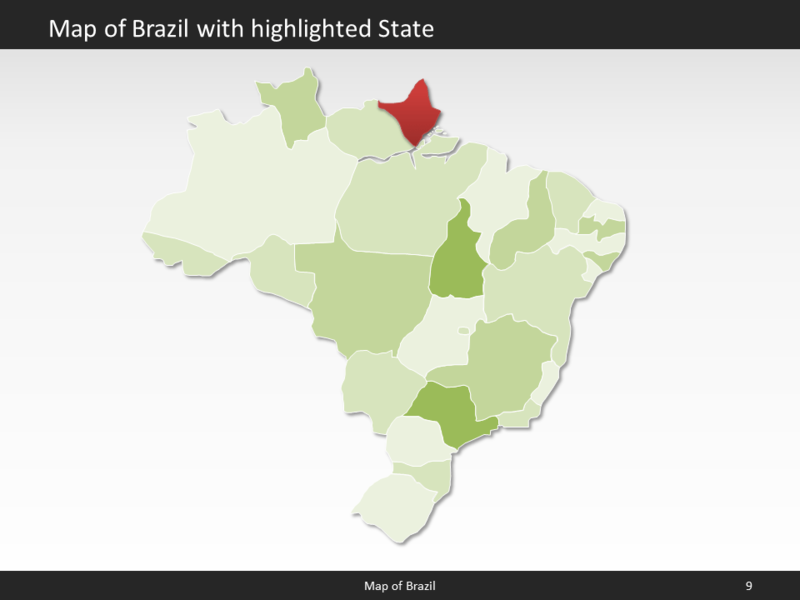 Facts and information about Brazil you can use in your presentation. 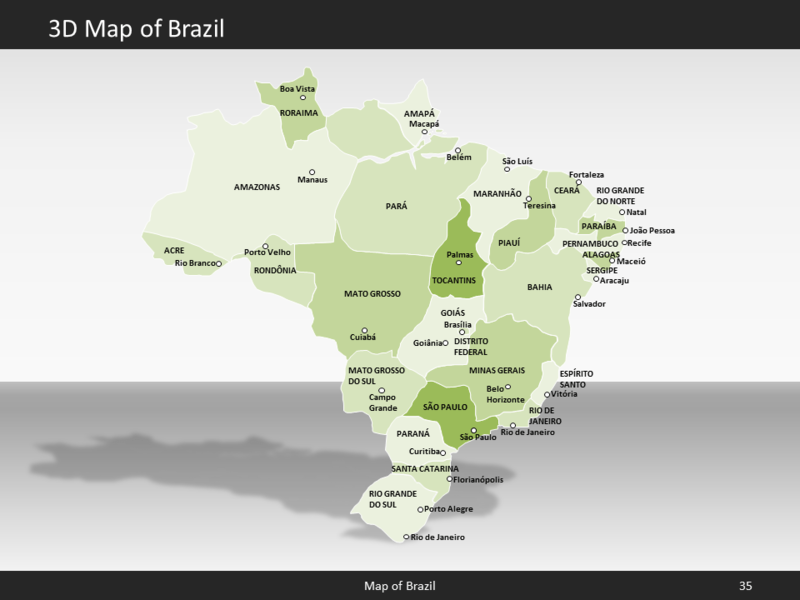 Brazil is often referred to as Federative Republic of Brazil or simply Brazil. 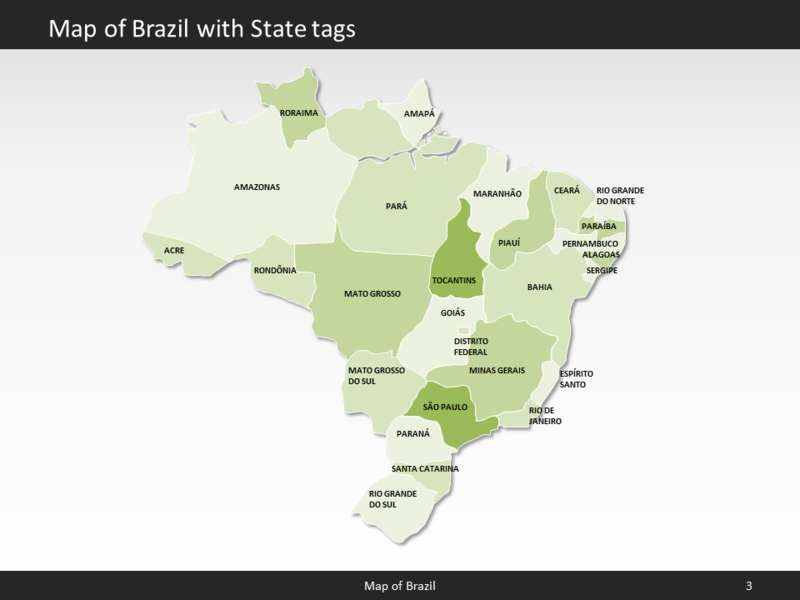 The locals also call the country Republica Federativa do Brasil or Brasil for short. The country name derives from the brazilwood tree that used to grow plentifully along the coast of Brazil and that was used to produce a deep red dye. The country's flag has the colors green, yellow, blue. 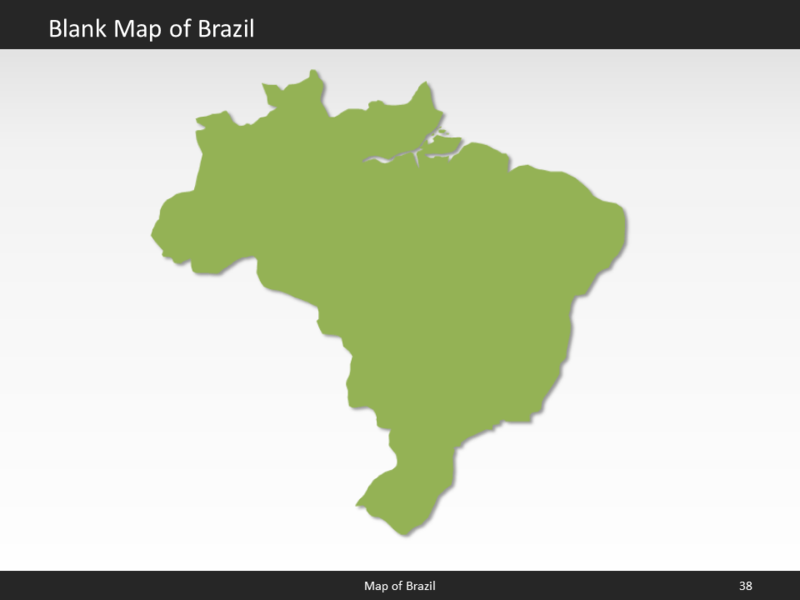 The country of Brazil lies 10 00 south and 55 00 west. The region has a total area of 8,515,770 sq km with a land coverage of 8,358,140 sq km. About 157,630 sq km is covered with water. 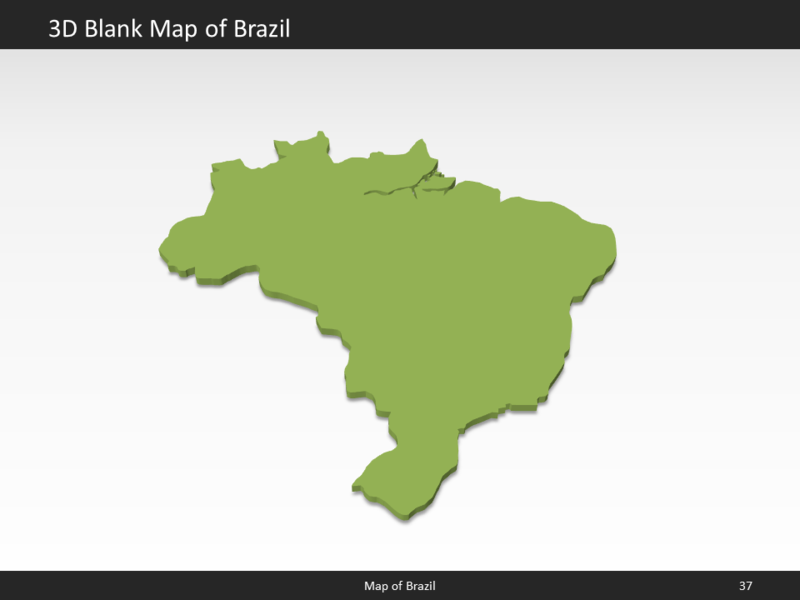 Brazil has a total border lenght of 16,145 km and is bordered by the following 10 countries: Argentina 1,263 km, Bolivia 3,403 km, Colombia 1,790 km, French Guiana 649 km, Guyana 1,308 km, Paraguay 1,371 km, Peru 2,659 km, Suriname 515 km, Uruguay 1,050 km, Venezuela 2,137 km. The lowest point is Atlantic Ocean 0 m below sea level and the highest is Pico da Neblina 2,994 m. Its mean elevation is about 320 m. Brasilia is the capital of Brazil and can be found 15 47 S, 47 55 W.
In July 2016 Brazil had a population of 205,823,665 people. In 2015, 85.7% of the population lived in cities. The annual growth rate of urbanization is 1.17%. 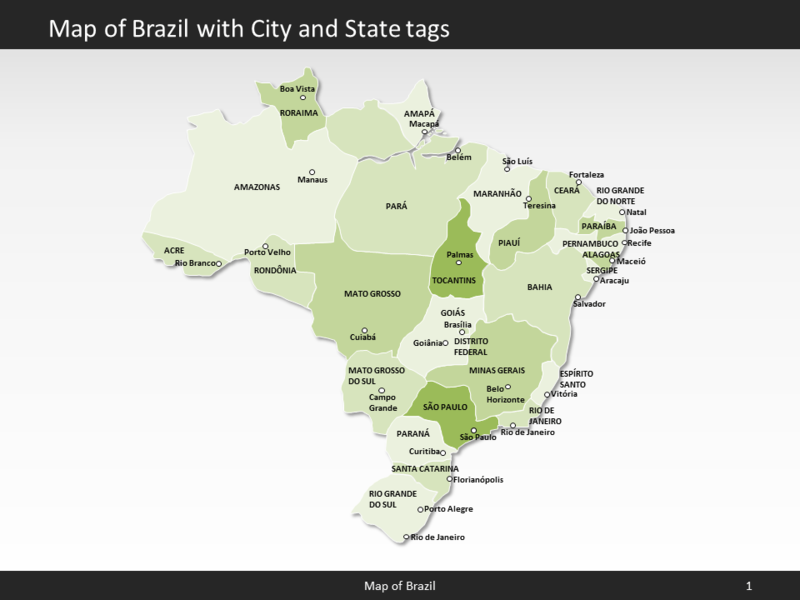 The residents of the country are called Brazilian(s). The Brazilian population has a median age of 31.6 years. The median age for males in 2016 was 30.7 years, and 32.4 years for females. The estimated growth rate of the Brazilian population in 2016 was 0.75%. Looking at life expectancy, the Brazilian people live an average of 73.8 years (males 70.2 years, females 77.5 years). Statistically, Brazilian women give birth to 1.76 children in their lifetime. The estimated gross domestic product in 2015 was about $3.192 trillion, with a growth rate of -3.8% compared to 2014 (GPD 2014: $3.32 trillion, growth rate 0.1%; GPD 2013: $3.317 trillion, growth rate 3%). The economic sectors of Brazil are: agriculture: 5.9%, industry: 22.2% and services: 71.9% (2015 est.). The country's economy is known for: textiles, shoes, chemicals, cement, lumber, iron ore, tin, steel, aircraft, motor vehicles and parts, other machinery and equipment. Only 99,5% (800) of the people living in Brazil had full access to electricity in 2013 (rural population: 97%; urban population: 100%). Among those 59.1% (July 2015 est.) or 120.676 million Brazilians, had access to an internet connection.